Naval architect KNUD E. HANSEN reports it has signed a contract with Chinese shipbuilder Nanjing Jinling Shipyard to develop the basic design of a number of large RoRo vessels, based on a Grimaldi/KNUD E. HANSEN concept. The new vessels, the first of which is expected to be delivered in 2020, will have a length of 238 meters, a beam of 34 meters and a gross tonnage of 64,000 metric tons. Each will be able to transport more than 7,800 lane meters of rolling units, equivalent to approximately 500 trailers. KNUD E. HANSEN Managing Director, Finn Wollesen, said the new generation of vessels represent advancement in terms of sustainability and efficiency by using various new technologies. 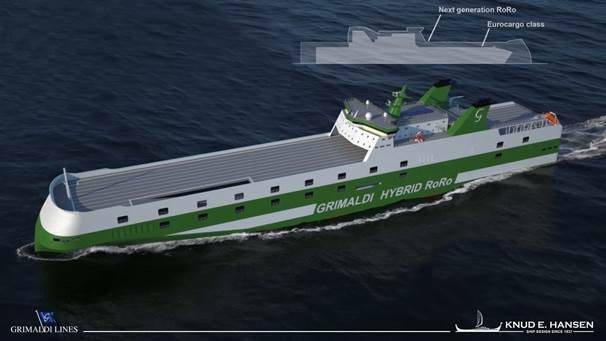 The design was developed by the Technical and Energy Saving Department of the Grimaldi Group together with KNUD E. HANSEN in close cooperation with the shipyard. The RoRos are known as the Grimaldi Green 5th Generation (GG5G). The vessels will use electricity in port, courtesy of large lithium batteries, thus generating zero emissions while at berth. These batteries will be recharged during navigation, through shaft generators adding the peak shaving system, and with the aid of 600 m2 of solar panels.